Julianne Beebe teaches English at Poly High School. Courtney Venema teaches fourth grade at Longfellow Elementary School. Michelle Fennell teaches history, drama, Spanish and physical education at John Muir Academy. Venema earned the Los Angeles County Teacher of the Year honor and advances for consideration as California Teacher of the Year. 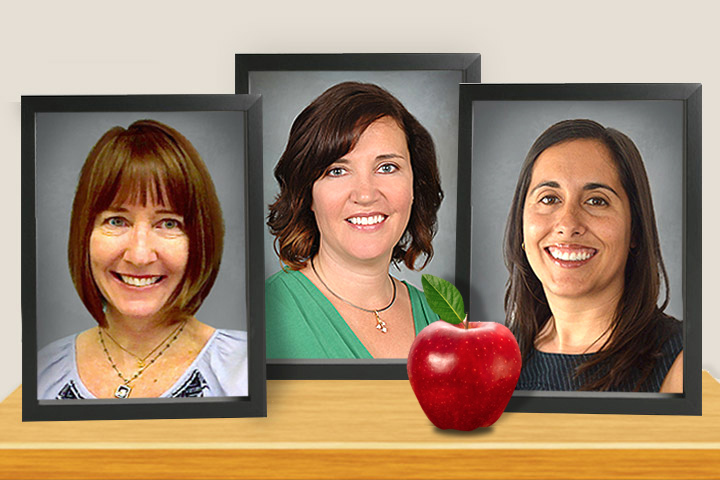 The three were honored at a recent Board of Education meeting, and at a Los Angeles County Office of Education luncheon along with other teachers from across the county. Julianne Beebe begins each school year with a vivid simile. She remembers clearly the moment when she saw the possibilities of what she could accomplish in the classroom. Her approach to teaching is guided by a simple observation. Courtney Venema began her teaching career as a resource specialist without prior employment as a classroom teacher. Following that experience in a fourth grade classroom, she applied to become a GATE/EXCEL (gifted and accelerated) teacher to further challenge herself and become an even stronger teacher. Her own path in the profession has helped her to connect more easily with students. She considers herself a lifelong learner and is fascinated with how people learn. Michelle Fennell approached the classroom by knowing the kind of teacher she didn’t want to become. But after some successful teaching experiences as a camp counselor during a summer vacation in high school, she changed her appraisal. Fennell follows through with precise accommodation to each student’s way of learning. Her teaching relies on helping students to make the most of their opportunities. LBUSD TEACHERS OF THE YEAR — Julianne Beebe, Courtney Venema and Michelle Fennell.